“Fish Like a Guide, But, Live Like a Client” fly fishing schools for 2017 are April 14-19 and April 23-29. Includes 6 nights lodging and meals, 5 days of classroom instruction and plenty of guided fly fishing on local waters. Our fly fishing schools are great for the beginner, novice, and seasoned anglers alike. 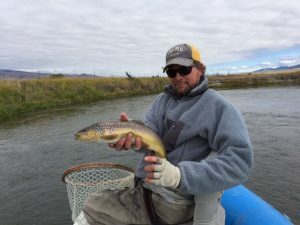 Mike can tell you that he has been guiding for over 30 years learns something new from our guides whenever they get the chance to fish together. We can also provide loaner equipment if you need: rods, reels, boots, waders, etc. The guides here are convinced most of the truly big trout on the Big Hole come out at that time of year. Give Mike a call for more details, 406-459-2030.